Old postcard view of Detroit's Michigan Central Railroad Station & Tower. For several generations it was one of the iconic images of Detroit: the majestic Michigan Central Railroad Station & Tower. 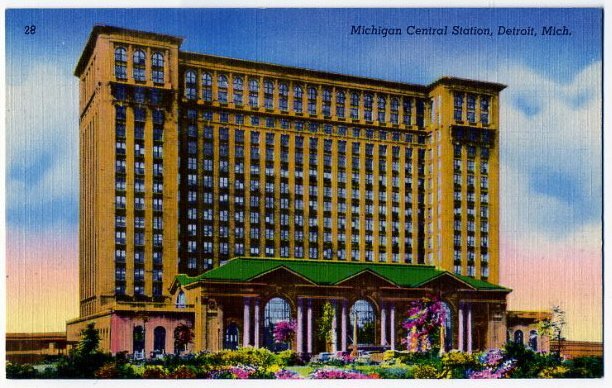 For newcomers to Detroit, the Station was often the entry point to this once prosperous city, capital of the world automobile industry. The image of the Station today still carries a message -- but it's a message of a city in decline. 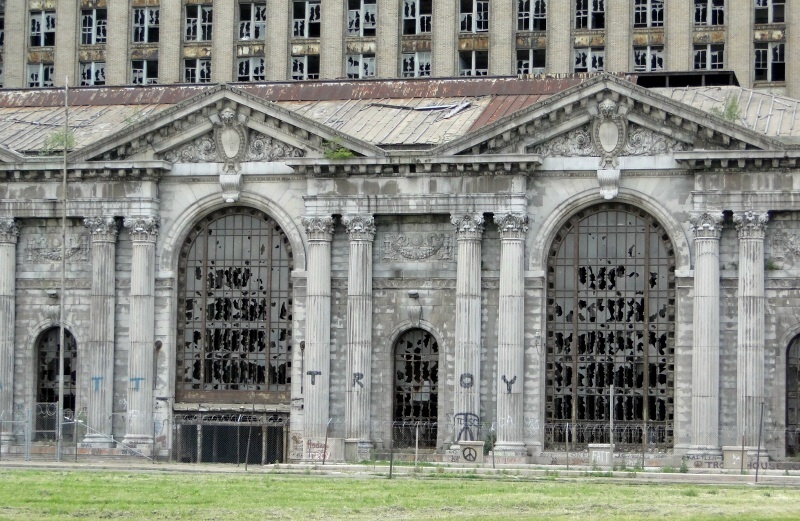 Detroit''s Michigan Central Railroad Station & Tower today. But does that mean the best solution is for the City to tear down the structure? Karen Nagher, Executive Director of Preservation Wayne. 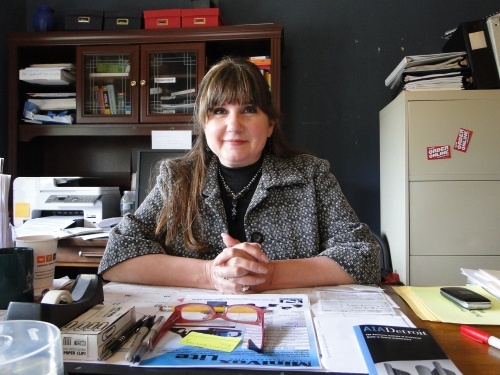 The alternative approach, described to me by Karen Nagher, Executive Director of Preservation Wayne (a citizens advocacy group for preservation in the Detroit area), is to "mothball" and stabilize the building for now, and wait for the economy to improve. The hope is that sometime in the future an innovative adaptive reuse will emerge. Moreover, as Nagher points out, the City has no plans for the site after the Station is demolished; there will just be one more large vacant lot in the heart of Detroit. Complicating matters is the fact that the Station's billionaire owner Manuel Moroun (also owner of the nearby Ambassador toll bridge, which handles one-fourth of all commerce between the U.S. and Canada) has not invested much in the structure. It's time for the structure to come down, city officials argue. But once torn down, preservationists point out, Detroit will have lost an important part of its heritage -- one more structure among many that have been demolished. 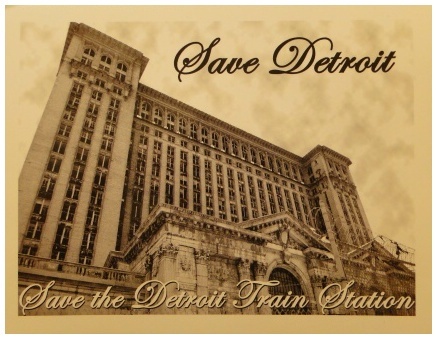 Indeed, on the very same day I was in Detroit, Preservation Wayne had just lost a court hearing to try to prevent the final demolition of old Tiger Stadium, not far from the Michigan Central Station. In fact, in the photo immediately below both are visible. 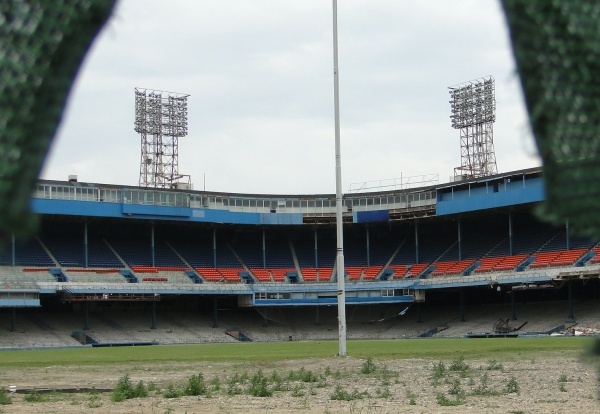 Tiger Stadium in Detroit being demolished. 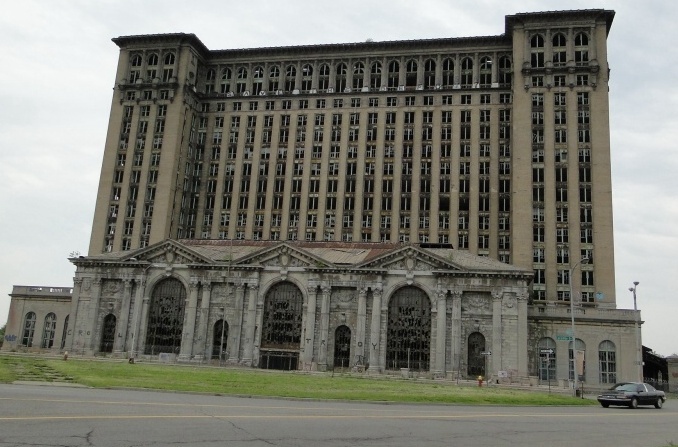 Demolishing buildings like the Michigan Central Station and Tiger Stadium may actually carry an economic cost. Not only does a city's historic fabric draw tourists, it also makes a city more attractive for business -- and it helps instill that "pride in community" city officials often talk about. There's one other benefit that Michael Boettcher, a city planner who also volunteers for Preservation Wayne, mentioned. Younger people are especially drawn to authentic places, where historic structures are valued. The bottom line is that cities that care about their past are also investing in their future. Update June 16, 2009: shortly after posting my report from Detroit I learned of an effort in Buffalo, New York, to restore that city's old New York Central Terminal (see photo below). It's an example of how hard work is starting to pay off in a restoration comparable to what may be needed in Detroit. I hope that Detroiters will take a look at the Central Terminal Restoration Corporation's web site, and pay a visit to Buffalo. Success can happen even with a building that poses daunting challenges.